Cougars provide an important function in keeping deer and elk herds from overpopulating and damaging the environment. They are very territorial and protect their territory against intrusion by other cougars. In other words, they self-limit their own population. 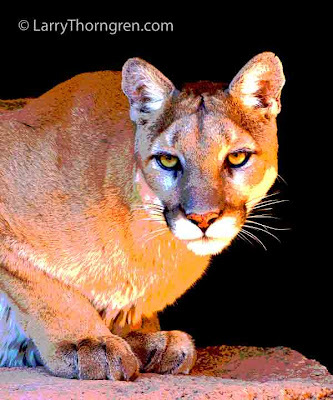 Anti-predator campaigns by fish and game departments and hunters disrupt the territorial distribution of cougars and cause more harm than good. Researchers can disrupt the natural behavior of cougars as well. A few years ago, a University of Idaho researcher strapped radio-collars on EVERY cougar in the northern part of Yellowstone National Park. She did it by chasing them down with hounds and then darting them with immobilizing drugs. That is right, she used HOUNDS in Yellowstone National Park to capture wild cougars who are supposed to be wild and free. I took this photo of a cougar at the Desert Museum in Tucson, Arizona. I prefer to see animals in the wild and I am not a great fan of Zoos, but the Desert Museum does as good a job of taking care of their confined animals as any I have visited. I posterized this photo to give it a little more saturation and dramatic effect.